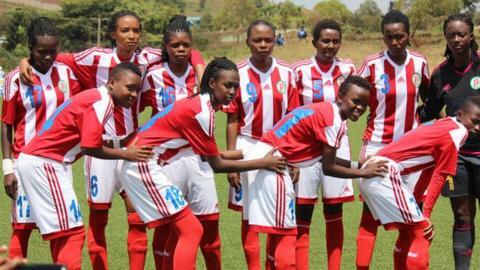 Burundi and Kenya kicked off the 2016 Cecafa Women's Championship with wins in the industrial town of Jinja, Uganda, despite problems off the pitch for tournament organisers. The inaugural event got underway with a handful of fans at the FUFA Technical Centre as some teams complained about accommodation, claiming their players are sleeping in a hostel where eight beds are packed in one room. Burundi beat Zanzibar 10-1 in the opening Group A game with Kenya then defeating Uganda's Crested Cranes 4-0. Burundi showed no respect to a Zanzibar side who had a player sent off as Djazilla Uwimeza netted a hat-trick, while Maggy Mumezero and Saidi Sakina Bukuru scored two a piece. Aziza Misigiyimana, Nella Uwimana and Joe'lle Bukuru scored the other goals for Burundi. Zanzibar's goalkeeper Mohamed Amina Kitambi was shown a red card for handling the ball outside the box. Skipper Abdullahi Abdallah Mwajuma scored the lone goal for Zanzibar from the penalty spot. In the second game, Kenya took a first half lead against Uganda through Mary Wanjiru Kinuthia. The Kenyans dominated the second half with Mbeyu Esse Akida and Vivian Corazon adding the to score-line and Akida then getting her second of the day. "We played a tough team and we need to go back to the drawing board for our next games," said Ugandan coach Magida Nantanda. Kenya's captain Mary Wanjiku Kinuthia said she was "excited" to start the tournament with a big win, saying it would "motivate" them going forward. Cecafa Secretary general, Nicholas Msuonye said he was happy the event had finally started. "Anything to do with accommodation and local transport and meals is handled by the hosts Uganda," said Musonye when asked about the off pitch challenges. But Rogers Byamukama, the Local Organising Committee Chairman, said they had agreed to have the teams in good hostels and that is what they will try to achieve. Action in the Cecafa Women's Championship resumes on Monday with the Kilimanjaro Queens of Tanzania facing Rwanda in Group B, a group which also includes Ethiopia.